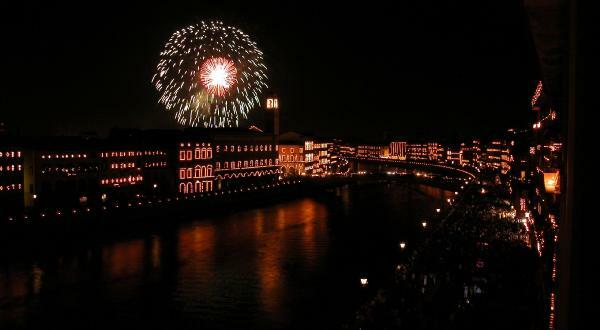 On the night of the 16th of June of every year the enchantement of the Luminara of Saint Ranieri is renewed on the streets running along the river Arno in Pisa. Pisans celebrete their patron, Saint Ranieri, on 17th of June, but the Luminara begins the day before. About 70.000 wx candles meticulosly set in glasses and fixed to wooden white-panted frames, the so called “biancheria“, are modelled in such a way to exalt the outline of the palaces, the bridges, the churches and the tower reflecting the river. The leaning Tower is illuminated too, by oil lamps, set also in the crenellations of teh city walls of alla Piazza dei Miracoli. The event offers the visitor a unique feeling: the reverberation on the many tremblig lights on the Arno and the candles that are left foating on its waters semm to.